So I thought I would take some pictures while there was still a little sunlight left. Overall I am pleased with this attempt. It’s not perfect but by the end of the second bobbin I was really starting to see where I was doing things wrong and how to do them better. I absolutely love the way that it seems to magically go from a lump of fluff to yarn, as though I am pulling it out of thin air. 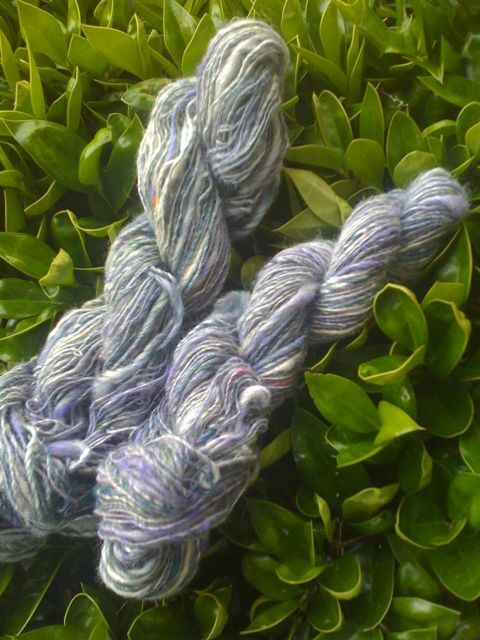 I plied up a small sample and didn’t care for it plied. It gave me some great ideas, but I don’t like it plied. I am so glad that after my initital tries at long draw, that I gave up and stuck with the short forward draw because personally I needed to learn how to had control over my yarn before I could let go and let the long draw happen. That may sound weird, but that is how my brain works I guess. I am really proud of myself because besides switching from spindle to wheel, I haven’t really taken many chances with spinning. I have chosen to not learn other techniques and I don’t know why. That stops now. I can’t say that I will try something new daily or anything, but as I get more materials and time, I am definitely going to be adding to my spinning skills. So here’s the picture. Two skeins of singles. Both are close to 130 yards. The weight varies from probably about a dk to bulky but I haven’t checked WPI or anything. I pretty much love my yarn. Well I did it. I sat down and made myself long draw. Special thanks to my Tweeps who helped with tips and links! I spun two bobbins. I am totally in love with the yarn that I made, even though it reminds me of something a kindergartener would draw. It is full of slubs but I love it. This was my first successful attempt at long draw. I spun from the fold mostly. I have a pretty good handle on it although I need more practice for consistancy. I haven’t decided if the yarn will be plied or not. I love it as a single so we will see. I will try to post pictures later since the sun is just now starting to come up.